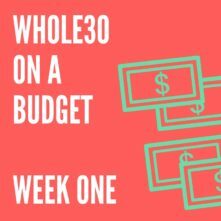 The fourth and final week of my budget Whole30 experiment is in the books (and up on the blog, finally). 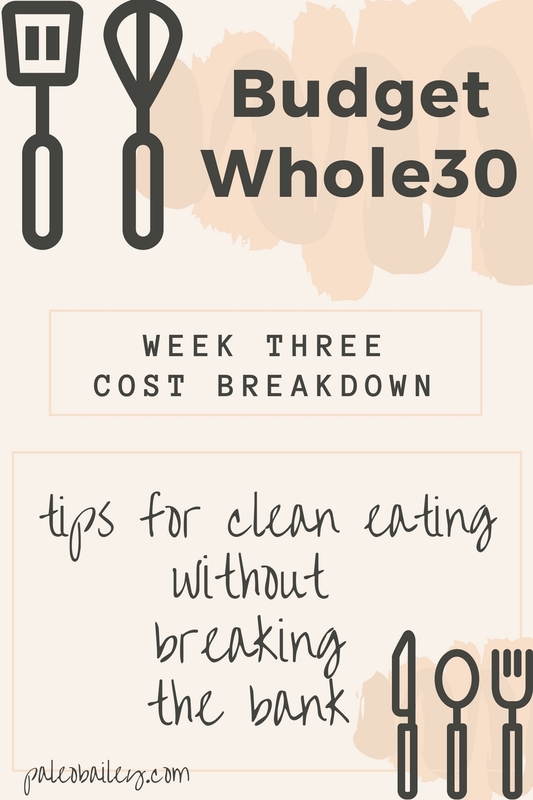 I really wanted to put together a resource to show that it doesn’t have to be crazy expensive to eat healthy or do a Whole30. I set out to prove that you could totally do it without spending a ton of money and I hope I’ve shown you a few ways to make that possible. My main goal was to not just rely on cheap roasted chicken and cheap roasted vegetables for 30 straight days to do this, either. You can make both varied and delicious food that you look forward to eating and stay within a limited food budget. 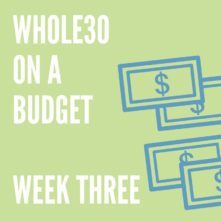 In my Week 3 budget Whole30 post, I mentioned that for the final week I was going to try simple meals that consisted of just meat and veggies instead of recipes to show just how cheap it could be. However, to be totally honest with you, I totally forgot. That just goes to show you that you can be frugal but not just eat meat and veggies everyday on their own. You can be creative and have fun with it, too! Not that there is ANYTHING wrong with having some grilled steak and veggies for lunch, by all means. I do that too! I always usually have some sort of roasted meat on hand for emergency lunches and easy to throw together meals. It’s a lifesaver plus it’s easy on my wallet. After my breakfast hash ran out, I ate Aidell’s chicken and apple sausage from Target. Remember in Week 1 when I purchased 2 packages? That second one was utilized this week after I ate all of the breakfast hash that I made. I had to purchase a few things this week at Whole Foods, which increased my food budget a little bit. I could have made other recipes that didn’t call for things I had to go to Whole Paycheck for, but I’m going to get to that in a minute. So while I managed to save a ton of money, I know I could have gotten it lower. 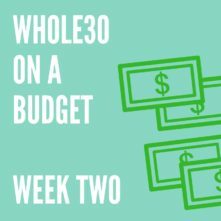 This week, on our last edition of budget Whole30-ing, I want to talk about what to sacrifice and what to indulge in. I made a recipe that called for nutpods (or almond milk). I LOVE nutpods and use them daily either in coffee or cream based recipes. 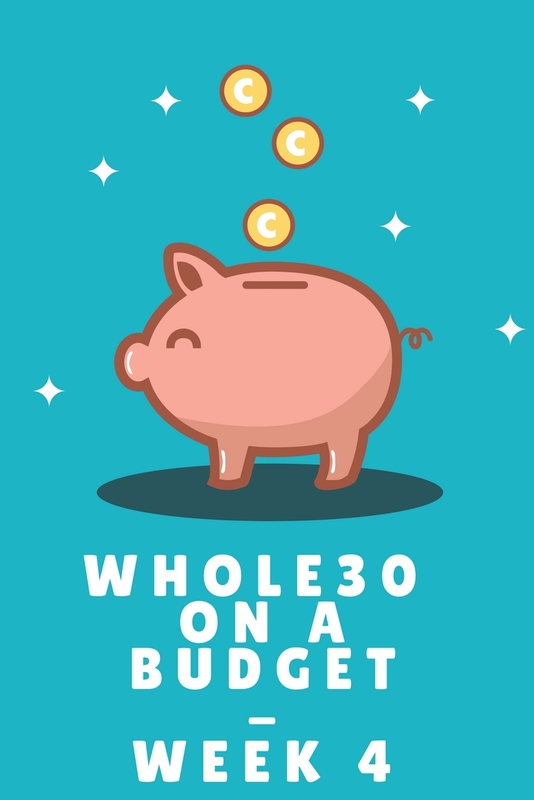 Nutpods are a totally nonessential element to completing a Whole30 however, especially if you’re doing a Whole30 on a budget. I feel like I can hear Melissa Hartwig’s voice in my head telling me to drink my coffee black during my first round of Whole30, when none of the compliant milks were in existence. I also made dinners that had a prepackaged Caesar dressing. Another thing that you can totally do a Whole30 without. My reasoning for why you may be able to include some of these things is pretty straightforward. I choose to be diligent, look for deals and use my money saving tips. 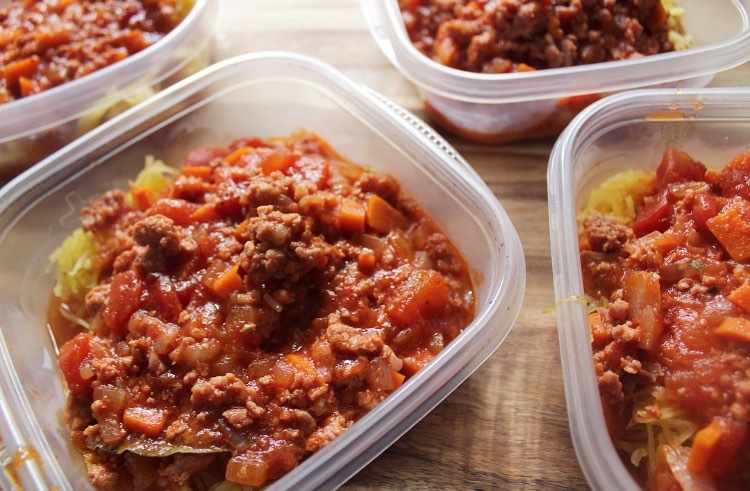 I save enough money in most areas of my food budget by shopping smart, prepping and batch cooking that it makes up for purchases that truly make my life easier. If you’re doing a budget Whole30, I obviously don’t recommend buying everything that makes your life easier. You don’t need to purchase every single approved item! But I do think if you’re making sacrifices in some areas by tightly budgeting, choosing a few things that will either really come in handy, make things easier or help you get through the 30 days better are sometimes worth it. If you really do not like your coffee black, purchase a 3 pack of nutpods but make them last through your whole 30 days. If you don’t use mayo that often, maybe factor a jar into your food budget. If you know you won’t have time to make compliant ranch, it’s okay to buy a bottle if you’re saving that money elsewhere. Sometimes your time is worth more than the money for the product you’d spend, catch my drift? Just be smart about what you’re buying prepackaged and only buy what you’ll truly need because that’s where it gets super expensive. Some of the other things I purchased this week that didn’t go into a real “recipe” were seasonal veggies for roasting and a package of 6 kiwi that I got for 2 bucks. This is one way I save money, especially later in the growing season. Seasonal veggies are cheap and often on sale the further along in the growing season it gets because there’s a surplus. Check your local ads or farmer’s markets and I’m sure you’ll find some crazy good deals. I also used 2 cans of tuna that I had in the cupboard already to make tuna salad for random days throughout the week as I needed random quick lunches or whatnot. For that I used ingredients I already had for other recipes during week 4. Like onions, lemon juice and greens to put the tuna salad on top of. 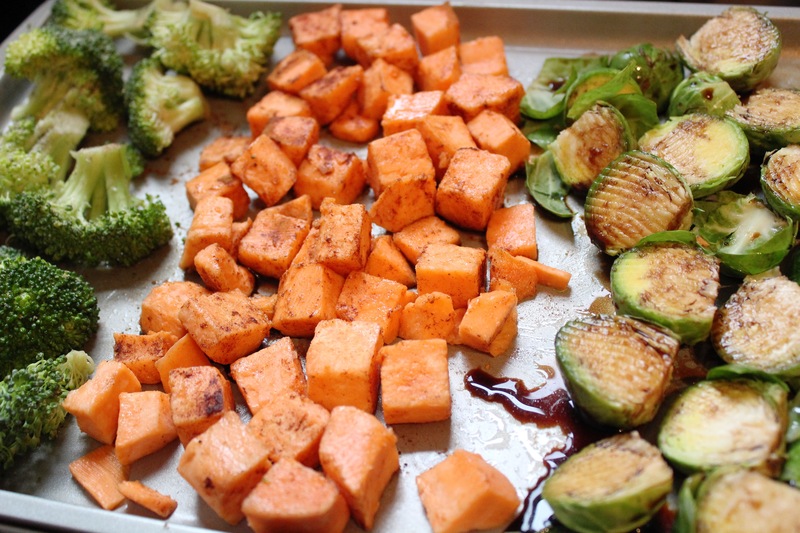 During the first and second weeks, I made excess food or doubled recipes to freeze for later. This final week I used up the rest of what I had prepared and frozen. This filled in random dinners and snacks if I needed them. I used up every single thing I had in both the freezer and fridge and didn’t waste a single thing. I really think going into the grocery store(s) with an airtight meal plan and shopping list is the way to go if you’re trying to save money. This will keep you on track and only putting the things you actually need in to your cart in the quantities you actually need them in. Another tip on saving money if you are a multiple store shopper like I am when I’m doing a budget Whole30 is to always start at the store that has the cheapest food first. Try to get everything you can there (unless you know there’s a good sale on chicken or oranges or whatever somewhere else) before going to the second least expensive store and then the next least expensive store… and so on. You should end at the most expensive store with only a few things left that you need. I never start at Whole Foods. I only go there after I’ve gotten the bulk of my necessities at the farmer’s market, Aldi, Target or Trader Joe’s. By that point, I’ll only have a few things left to cross off my list. Usually speciality items or meat products I can’t get at other stores. Shopping this way helps me cut my food budget exponentially. So there ya’ have it! 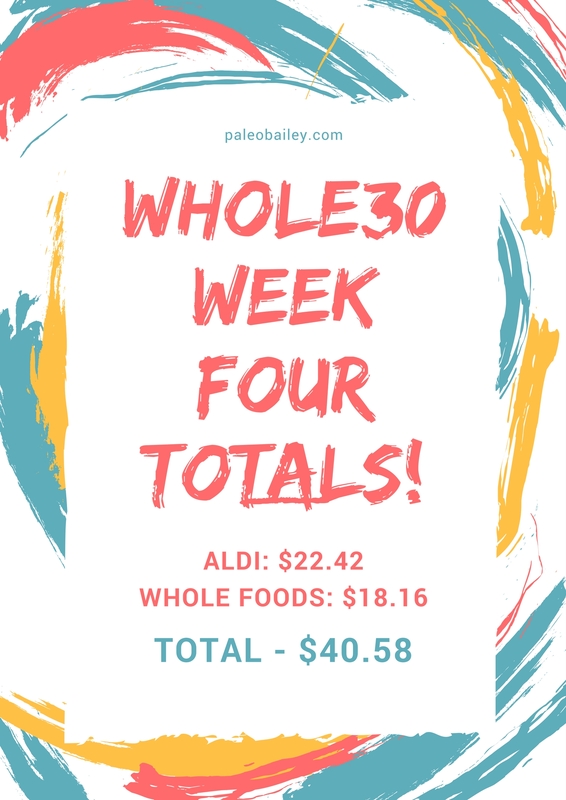 4 weeks of how I save money, keep costs down and do a budget Whole30 successfully! If you have any other tips, let me know! And stay tuned for a complete wrap up of the monthly totals and all of the tips I included in each post! For now, click back through the weeks and check out the tips I shared or pin for later!